Each session is 7 weeks longs and includes 20 class hours/week. 1. Application: Complete all sections of the ALCI Application Form (writable PDF). 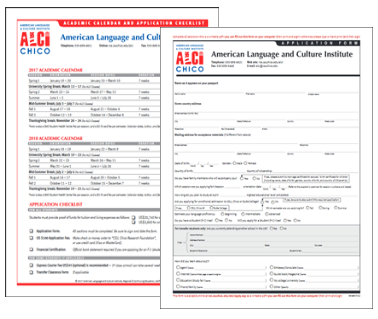 Sign and date the form and then send it back by postal mail, fax, or email to alci@csuchico.edu. 2. Application Fee: please enclose a non-refundable check or international money order drawn on a US bank for $100USD payable to “CSU, Chico Research Foundation” with your application. Enclose an additional check or money order for $45 USD if you want your admission documents sent by express mail (2-3 day delivery). Application fee can also be paid online by credit card (Visa or MasterCard). 3. Financial Certification: required if you are applying for F1 Student Visa. Please submit an official bank statement (copy is acceptable), less than 6 months old, in English, and stamped/signed by bank official. 4. Conditional Admission: If you are also seeking Conditional Admission to the University as an undergraduate, you must apply by the University deadline prior to the ALCI session you plan to attend. Questions? Email alci@csuchico.edu if you have any questions. We are more than happy to help you. If you are a sponsored student you must include a letter from your sponsor verifying the amount of your funding. If you are currently in the US on an F-1 (student) visa you must submit an ALCI Transfer Clearance Form and a photocopy of your I-20, I-94, and visa. Sometimes a student needs to postpone his or her attendance at ALCI and be sent a revised I-20. We need to ask for a $75 reactivation fee, payable online, for all students who request a deferral to a different session. An updated financial certificate may be required. To qualify for admission to ALCI, your secondary education must be complete, and financial documentation of sufficient funds for your educational and living expenses must be submitted. During the new student orientation, you are required to show proof of vaccination against mumps, measles, rubella (MMR) and a recent tuberculin skin test that shows negative for tuberculosis within the last 3 months. Please have your physician verify your immunizations on the International Student Health Certificate Form. If you do not have these records at orientation, you will be required to visit the Student Health Center during orientation to receive a MMR vaccination and a tuberculin (Quantiferon) test. The MMR vaccination will cost approximately $60 USD, and tuberculin (Quantiferon) test will cost approximately $50 USD. California State University requires that all international students have valid medical, evacuation, and repatriation insurance coverage at all times during their academic program. You MUST demonstrate proof of coverage (in English and/or US$) at time of Orientation. You may bring a policy from home or you will have to purchase insurance when you arrive. Option 1: One session at a time – students will be required to renew their policies before the beginning of the next session. Option 2: The entire length of your program of study – no renewal necessary. ALCI will verify students’ insurance coverage. Be sure to keep a copy of your proof of coverage with you. It is important to consider your visa category before applying to ALCI. If your primary purpose for visiting the US is to study, you are required to have a student visa (F-1). To obtain a student visa, you must submit a financial certificate as evidence of sufficient financial support, submit an application fee and a completed application to ALCI, and then await receipt of an I-20 from the institute. With your ALCI I-20, you should then apply for a student visa (F-1) at the US Consulate or Embassy. Contact the US Embassy or Consulate near you for a visa application and important updates on new immigration regulations. 2019 tuition will be $2,200 USD per session. Tuition may be paid online with a credit card. There is also a $96 Student Health Services fee per session for full-time students, and $2 Student ID Card fee, which must be paid in person in the ALCI office. Application fees and the Student Health Services fee are non-refundable. If you withdraw from ALCI on or before the first day of class, you are eligible for a full tuition refund minus a $10 processing fee. Be advised that the processing time for refunds is 2–3 weeks. A maximum of 65% of tuition is refunded if you withdraw during the first week of classes. No refund can be issued after the first Friday of the session. • Your attendance has caused you to lose your F-1 student status. Let us Know If You Have Questions? We understand that the process takes time and effort. If you have a question, please contact us. We are here to help you through the application and Visa process. 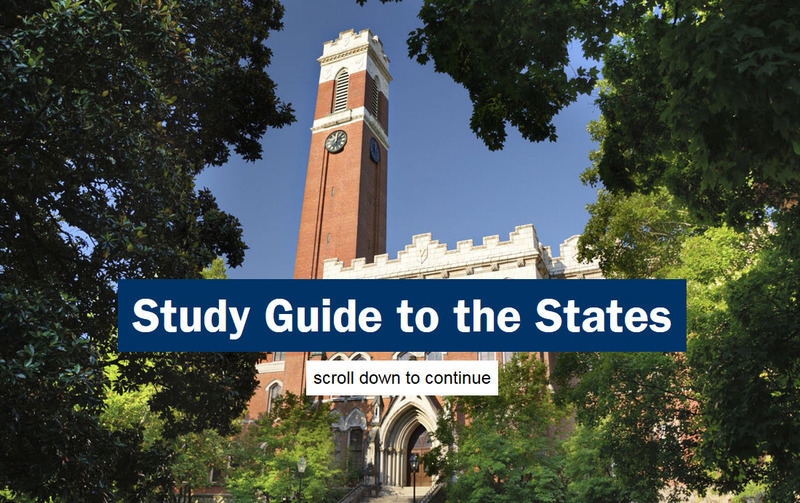 Check out this Study Guide to the States, a simple, step-by-step approach to what you need to know when you are considering studying in the United States.